‘Do you like soccer?’ asked the tanned bald headed Brazilian man sat beside me. I had been in my seat on the plane for fifteen minutes listening to a group of fourty Brazilians raucous laughter and jolly conversation, quietly worrying to myself that this was a taster of what was to come on my eleven hour flight from Paris to Sao Paulo, when Marcelo introduced himself. I could feel the tension in my shoulders ease as we launched into a pleasant but disjointed conversation. But this smiley chap’s broken English did not stop him – his enthusiasm was contagious and I found myself flicking through photos of his trip to Israel shortly after we had taken off. As I scrolled through, I admired the beauty of Jerusalem and began to feel a fondness for Marcelo who had taken me under his wing and distracted me from the leg crunching economy class seats. My time on the flight flew by and as I pulled my suitcase off the carrousel, I looked back to wave goodbye to Marcelo before leaving the airport and filling my lungs with the tropical South American air. Sao Paulo is a vast and beautiful city full of irony. A Favela sits in the valley of one of the richest districts of Sao Paulo. As I looked down on the pit of strangely beautiful, roughly built orange-bricked houses, I was told that the tall white building straight behind was an extremely expensive block of flats, each with a private swimming pool on the balcony. The distinct divide between the rich and the poor struck me. Every Sao Paulo mansion that we passed was heavily guarded – barred windows, wire fences, huge wrought iron gates. Even the deliverymen are not allowed to enter the grounds and most of the homeowners have implemented a large lazy Susan to ensure that no unwelcome guests are enticed. Around 3.9 million, a staggering 45% of the national work force in Brazil aged 16-24 is unemployed and 11 million young people are housed in informal settlements. 93% of jobs available to such youngsters offer no career progression so it’s no wonder there is such a large rich / poor divide. Having expressed an interest in a tour of a Favela, which plays home to more than 100,000 residents from all over Brazil, we were whisked off to meet David Hertz, founder of Gastromotiva, a social business that aims to promote Gastronomy as a way for social inclusion and to develop sustainable gastronomic enterprises in low-income communities. David’s objective is to help underprivileged youths develop personally and professionally and learn a mixture of work and life skills in order to create new businesses within their communities. Each semester enables thirty students to study at no cost and the varied program is composed of 280 hours, divided into lectures, practical classes, technical visits and practical training. A large group of us started at the top and walked down the hill on the parameters of the Favela, stopping to discreetly capture the foreign environment. I stood disgraced as I saw a member of the group standing a meter away from an old decrepit man sat in a doorway smiling to herself as she snapped away on her camera. I quickly slid past, embarrassed to be a part of the same group and walked past another woman stood in front of a barred porch wielding her camera as two little girls posed and smiled. Feeling uncomfortable at the thought that some were treating the Favela as a human zoo, I walked on and snapped at the scenery discreetly. We were reassured that the Favela was safe. Having watched City of God a few years ago, I was expecting mean faced drug barons wielding guns and waiting to pounce on any one of us. I couldn’t have been more wrong. Favela’s are very different in Sao Paulo – yes there is a drug problem but the lords are in Rio. So how did this huge town come to be right in the middle of one of the most expensive suburbs of Sao Paulo? The land used to be a farm and the idea was to produce large houses on the land but having been empty for a long time, people who had no where to live came and built on the land. Only 30% of the houses have running water and the narrower streets do not have garbage collection. But it isn’t all bad. Over the last few years, this Favela has developed – Banco de Brazil, the largest bank in Brasil is planning on opening a branch and the largest department store in the country has a store, which makes a higher profit than the branch in the local mall. 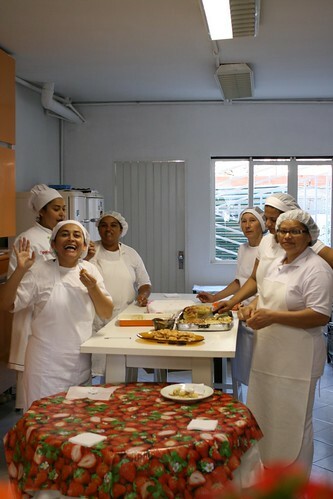 We visited a Government funded restaurant in the Favela, which opens Monday – Friday to provide breakfast and lunch, which is affordable for everyone who works and lives in the surrounding area. Breakfast consists of bread, coffee, milk and cheese bread and will set customers back 50 Cents (around 15p) and lunch consists of rice, beef, chicken, fish, dessert and a piece of fruit and will set customers back 1 Real (around 30p). The government provides 80 Cents for breakfast and 3.50 Real per person for lunch. The extra goes to employees and running costs. The restaurant was closed when we visited but we were given an idea of life for the locals. White walls and plastic chairs and tables adorned the room but it was clean and pleasant. At the end of our tour, we were offered lunch that had been cooked by current Gastromotiva students. During the course, they learn not just how to cook popular Brazilian dishes; they are also taught how to prevent food wastage. We queued for a buffet of chicken, farofa and delicious salads using banana skin. The irony of drinking champagne in a Favela was a little too much so I stuck to the freshly squeezed pineapple juice. After lunch we were guided safely back to our bus and taken back to the comfort of our hotel. I left inspired and sad but safe in the knowledge that help is there. It may be that Gastromotiva is scratching the surface but it is a very important cog in a large wheel that is slowly but surely making the quality of Brazilian life for many an awful lot better. very nice report from your foreign view from our metropolis. 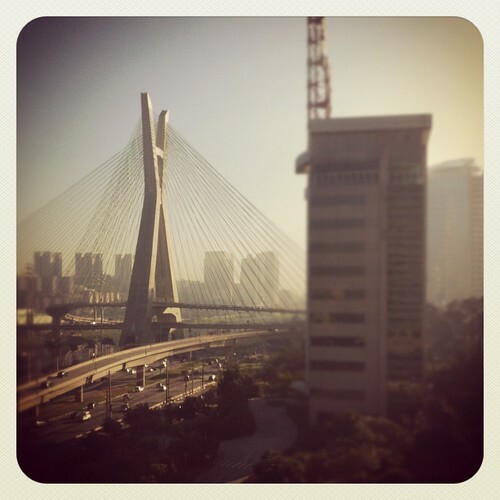 There’s no denial, Sao Paulo is indeed a city of contrasts and many struggle with poor economic conditions. The gap between a fancy room at the Hyatt hotel and a barraco in a favela is surely huge! Congrats for the sensitive point of view and captivating text!